“It does look like that,” I say, coiling my hands inside the jacket’s pockets. I continue nodding with a wan smile. Silence joins us soon. It’s past lunch time. “No, I am going home!” I say with some emphasis. She laughs and says, “You look so good, I thought you goin’ to work.” I feel a bit uncomfortable and notice, for the first time, her long, yellowed nails. After learning that I am still looking for work, she has much to tell me. “This is a bad time for new people to come in. There are no jobs,” she warns. I nod and try to maintain a neutral face. This is followed by an insider’s lowdown. How they “don’t pay too well, only the minimum wages,” but how that is better than not having anything. The bus comes, and my bus-stop friend takes the seat next to mine. True to her word, she points out to me the under-construction Wal-art. People around us are looking at me; I am beginning to get annoyed, but keep up a smiling face. And the nods. “And if at all they don’t take you for the counter, you can also opt for stocking. That means putting things on the shelves. Ya gotta take whatever comes your way,” my friend continues. I take in all the suggestions with total silence and utmost seriousness. A few minutes later, we both get down at the same stop. I thank her quietly and say a little prayer for all of those like her–surviving on minimum wages, but not short of concern and hands-on tips for a new immigrant. Occupy your city can wait. Occupy Wal-art first. 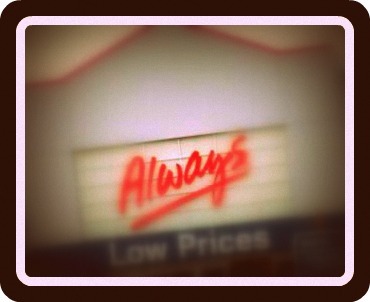 Where it’s “Always Low Prices.” Of the employees even. Excellent narration. So humble and poignant. Touches you. As usual, you hit the bullsye! I love the closer! Apu, I am so glad you liked it. Thanks! Joyce, you are kind as ever. And such a good reader. Thanks! very simply and poignantly put,i loved it. I am so glad you liked it, Santosh. Thanks for reading. Thanks for reading and commenting, Deepesh!